Many vegetables in the family Cruciferia are grown in New York, including cabbage, cauliflower, broccoli, Brusselss sprouts, Chinese cabbage, mustard greens, turnip, and radish. Although at least six viruses are known to infect cruciferous plants, the two most important viruses are turnip mosaic virus and cauliflower mosaic virus. Turnip mosaic virus (TuMV) is considered by researchers to be the most important and widespread virus infecting crucifers. The host range for this virus is not limited to crucifers; the virus also presents problems for lettuce and endive, spinach, and several bedding plants like zinnia and petunia. TuMV is not seedborne in any species, but is efficiently transmitted in a nonpersistent manner by several aphid species, most notably the green peach aphid (Myzus persicae) and the cabbage aphid (Brevicoryne brassicae). 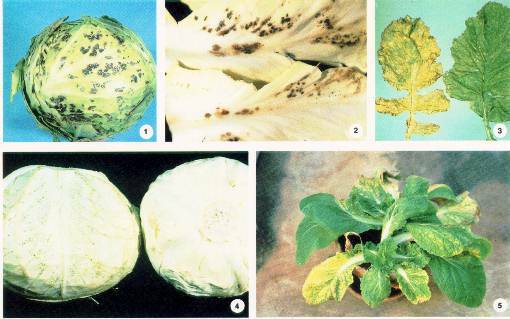 The virus causes mosaic and black necrotic ring spots in cabbage, cauliflower, and Brusselss sprouts (fig. 1). Necrotic spots may not be evident on cabbage heads at harvest, but may appear after 2 to 5 months in storage (fig. 2). These spots are the result of infections that occurred during the growing season. Infections do not spread among heads while in storage. Spotting may be found several layers deep within the head and appears on the midribs, the side veins, and in the interveinal areas where the spots may coalesce. This is particularly disconcerting because outwardly the heads appear normal. TuMV causes mosaic with leaf distortion and necrosis especially on the lower leaves of turnip (fig. 3), radish, mustard, and Chinese cabbage (fig. 5). Because TuMV is not seedborne in any species, the major virus source is mustard-type weeds like pennycrest and shepherdspurse that are able to overwinter. Make sure herbaceous weeds that can harbor both virus and aphids are destroyed before the crop is planted. Although insecticides cannot act quickly enough to kill aphids before transmission has occurred, insecticides do help to reduce aphid populations and reduce the rate of virus spread. Sources of resistance for TuMV have been found for some crucifers, and a seed catalog should be checked for the latest developments in plant breeding. Cauliflower mosaic virus (CaMV) is another virus capable of infecting crucifers, and its symptoms have often been confused with those of TuMV infections. Like TuMV, cauliflower mosaic is transmitted by the same aphid species in a nonpersistent manner. CaMV has a host range limited to crucifers and is distributed mainly in the temperate regions of the world. It is also one of the few plant viruses containing doublestranded DNA (deoxyribose nucleic acid). The virus induces mosaic and a striking veinal chlorosis in most of its hosts. A masking of symptoms may occur in chronically infected plants, particularly at high temperatures. Infected plants of turnip, Chinese cabbage, and other species tend to flower prematurely. Cabbage heads displaying "pepper spotting" and "vein streaking necrosis" in storage (fig. 4) were previously thought to be infected by CaMV. "Pepper spotting" has been seen on heads at harvest, but tends to be more common and increases in severity after several months in storage. The necrotic spots measure about 1 mm in diameter and may appear on both outer and inner sides of leaves. Recent studies in England failed to associate CaMV with "pepper spotting" or "vein streaking necrosis" in the variety Decma. The occurrence was attributed to a physiological disorder; evidence of other workers in the United States supports this conclusion. Fungal organisms such as Botrytis, Alternaria, and Rhizoctonia may cause spotting and speckling of the outer leaves of cabbage heads, and an aerial form of Rhizoctonia has caused internal spotting on some cabbage varieties. Because of the limited host range for CaMV, crucifer growers should pay particular attention to the elimination of cruciferous weeds from around seedbed areas and production fields. This should be coupled with early aphid control on the crop and bordering areas. Cooperative Extension. New York State College of Agriculture and Life Sciences, New York State College of Human Ecology, and New York State College of Veterinary Medicine at Cornell University, and U.S. Department of Agriculture, cooperating. In furtherance of acts of Congress May 8 and June 30, 1914, and providing equal opportunities in employment and programs. Lucinda A. Noble, Director.